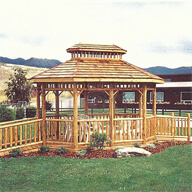 Diamond K Sales offers you Rocky Knoll Gazebos. 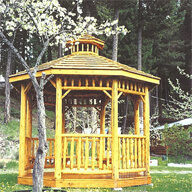 This family business is owned and operated in the Majestic Mountains of Montana. True quality and great service. 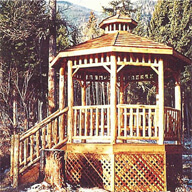 All log gazebos are hand pealed dead standing lodge pole pine logs with mortise and tenon construction, these log gazebos have the durability to withstand high winds and snow loads, ensuring many years of enjoyment. 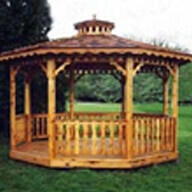 Quality Cedar Gazebos also available - in kit form for easy assembly, in two styles and a varied price range to meet your budget. 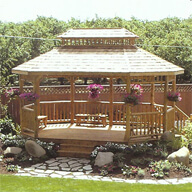 Amish custom crafted from naturally long lasting Western Red Cedar - with hot tubs and visible garden spots in mind. Each piece is hand selected and handcrafted to insure the highest quality. 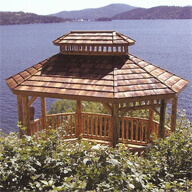 Assembly is easy with pre-assembled panel sections for the floor, roof, railing and a cupola. 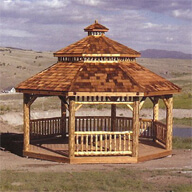 Please note: The cedar style gazebo is all cedar, - all styles have cedar shakes! ** OPTIONS available are benches and screen kits** We ship anywhere within the Continental United States by motor freight (common carrier). We are sorry, but we are unable to ship to Alaska, Hawaii or outside the United States.